Labour has retained the seat of Middlesbrough following a parliamentary by-election triggered by the death of the town's MP. Andy McDonald secured 10,201 votes - 60.5% of those cast - with Richard Elvin of the UK Independence Party in second place on 1,990 votes. Lib Dem George Selmer came third and Ben Houchen of the Conservative Party was in fourth place. The seat had been held by Labour's Sir Stuart Bell since 1983. The senior Labour backbencher died at the age of 74 in October following a short battle with pancreatic cancer. 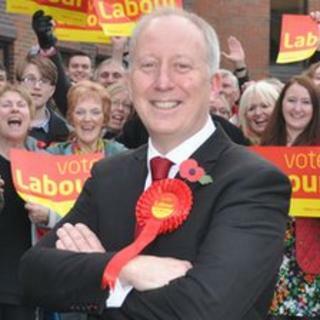 In his victory speech, Mr McDonald, a former councillor, said: "Middlesbrough, I promise to fight for you and I will not let you down. "Tonight you have a new voice in Westminster, a voice that will speak up for working families who are having their budgets squeezed, young people who are struggling to find their first job and the millions ignored by this Tory-led government." Mr Elvin said the result, which follows UKIP's second place in Rotherham, proved there was a desire for change. There were two parties celebrating after the by-election declaration. It was a good, comfortable win for Labour's Andy McDonald. The party's majority dropped by 500 from 2010 but its share of the vote actually increased. Realistically Labour would only have been threatened if the town's independent mayor Ray Mallon had carried out his threat to stand. But the other party with something to celebrate was UKIP moving from sixth in the general election to second. The party believes it is now better placed than the Conservatives and Lib Dems to challenge Labour in its northern heartland. He said: "There can be no doubt that UKIP is on the up. "UKIP is now the only political party which we can truly say can take the fight to Labour in the North East." The result was announced just after 01:20 GMT. There were eight candidates and the turnout was 26% - down from 51% in the 2010 general election. Mr McDonald lives with his wife Sally in the Linthorpe area of the town and works as a solicitor for a trade union law firm. Labour also won by-elections in Croydon North in south London and Rotherham.